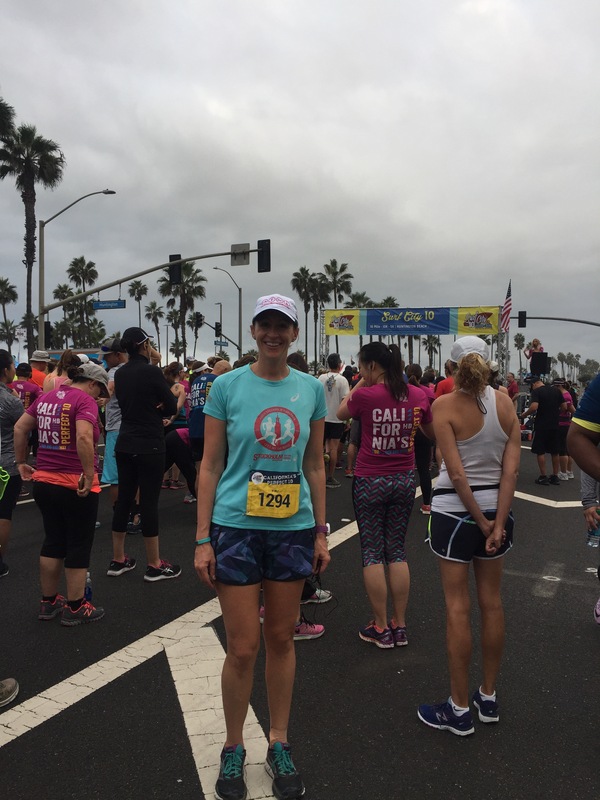 Running – Jaime Kurtz, Ph.D.
Well, myself and 35,000 others. Yet another reason to love Denmark. By chance, a few days ago I saw the Copenhagen version of the event pop up on Facebook. True to form, I signed up without a lot of forethought. But I quickly came to see that it was kind of a big deal. Like, a 35,000-person, shut-down-the-roads kind of big deal (read more here). And it was at 7 p.m. Because the earlier part of the day was taken up with OTHER royal running events (kids’ run, mile run, awards, pageantry, etc.). But why would I expect less? It was the prince. It was so unique; part of me wanted to take pictures during the race. But a much bigger part of me wanted to crush it. And I kinda did crush it – my first race with a sub-7:00 minute average, and a big 10K PR of 43:08-ish. The course was flat with few turns, there was no humidity, and the Vaporfly 4% is truly a magical shoe. This either bodes well for the Stockholm Marathon in two weeks or I just blew it. Anyway. It was a nice change to feel like a part of something here in Copenhagen. Sure, I don’t really know much — ok, anything — about the Danish royal family. I couldn’t understand a single thing that was being broadcast in Danish over the loudspeakers before or after the race. But, like everyone else out there, I get the pull of running through city streets on a beautiful spring evening. I felt genuine excitement and cheered along with everyone else when the prince walked by. Walking home with my medal, people said what I took to be “congratulations” in Danish and I gave them a “tak” in return. It’s nice to not feel like a tourist for a minute. Did I mention that I love Denmark? This started as a travel blog. But it’s accidentally become more of a running blog. And a sporadic one at that. I’ve gotten into the habit of writing recaps of my major races. Yet with spring on the horizon and finals week approaching, I’ve been putting this one off. Plus, what can I say that hasn’t already been said much better here, here, here, and so many other places? Plus: pressure. This was The One. I’ve been chasing the unicorn, quasi-literally and figuratively, for so long. I should be able to muster up something articulate! Thoughtful! Reflective! Instead, I feel monosyllabic, much like I was during the race itself:. UGH! BLAH! SHIIIIT! But, to keep up with this mini-tradition, I’ll do my best to lend something to the conversation. With less than a week between myself and this race, I must admit that, despite all of the ughs and blahs, my first Boston was pretty freakin’ great. Yes, I know it was maybe the worst weather in the race’s 122-year history. I know about the hypothermia and the crowded medical tents and the relatively slow finishing times. I was there. I have my own experiences of stinging rain, crippling headwind, waterlogged shoes, and nonfunctional fingers at the ready. This thing sucked. It was hard. Ridiculously, unforgettably, and indescribably hard. To prove my point, check out a few images of the Athletes’ Village in Hopkinton, before the race even started. But if I wanted easy, I’d stay home or take a beach weekend. The marathon is hard. We do it for that very reason. For the challenge, for the stories. To experience the new and the singular. To feel alive and vibrant. To redefine what is possible. To brag. To be a badass. Given all of that, on every single front, Boston 2018 delivered. Challenge and badassery galore. An experience like no other. Stories for decades, with grim photos to back them up (see above, and below, and any other blog or webpage chronicling this day). As for feeling alive…does it get any better than pushing through the wind, dodging puddles, rain stinging your face, music blaring, without a care in the world for what exists outside of this tunnel of cold, wet misery? Alive does not necessarily mean happy. But there were even some weirdly happy moments during this thing. Wearing a wacky but really toasty outfit of running clothes under massive Goodwill throwaway sweats under a Tyvek suit under a plastic poncho to the start was hilarious! And losing my “real” running hat – all technical and sleek – and having to wear the Pippi Longstocking monstrosity I got at the Goodwill as a throw-away? Funny stuff! (This hat was actually awesomely toasty and kept my headphones secure. Love you, Pippi-hat!) Looking at – but thankfully passing by – the Athletes’ Village, with its ankle-deep mud and hundreds of pairs of discarded shoes? Also a riot. Later, during the race, the Wellesley tunnel – thinned out as it was – provided a massive boost. And I had to laugh when a surprise crosswind swept through, so swiftly that my anklebones bumped into each other and drew some blood. The absurdity of this! WTF!? Yep. I got my money’s worth. And that’s saying a lot. Did I mention that, in addition to everything else, I had to go buy a new Lululemon outfit because of the shifting forecast and my poor packing? (I was not alone.) Add another $250 to the tab. Still – worth it! And my performance? Given the downhill nature of the first half, I was not too surprised to be going at PR-pace (sub 3:30), albeit smartly. But the weather just got worse, my spirits got lower, and the hills appeared, as I knew they would. I dropped back and did what may be the hardest thing of all – let go of my PR hope (which was never really part of the plan anyway) and tried to be compassionate to myself in the process. While this was not a glorious race or triumphant finish, I ran my third fastest marathon – a 3:39:46 – and beat my bib by a cool 6,008 spots. And I still have all my fingers and my toes and a love of running. Win! So, let’s have a redo next year, Boston. And while I like an edifying experience every now and then, I also heard that I missed out on some serious cheering and crowd love thanks to these elements. Mother Nature, you can be a little less dramatic next time, mmmk? 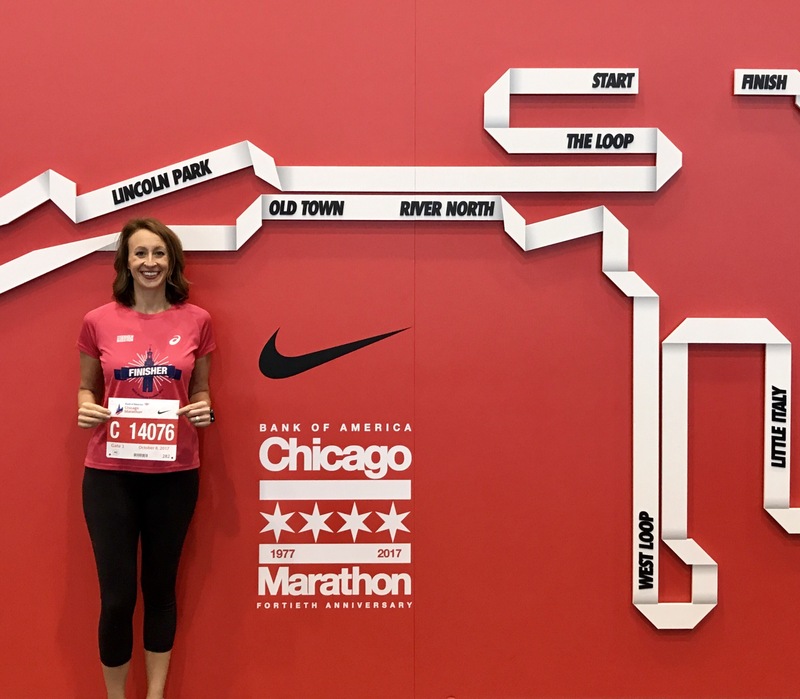 On October 8th I ran my 8th marathon through the crowded, lively streets of Chicago. This was, by far, the largest marathon I’ve ever run (in fact, it’s the second largest in the world, and the fact that they pull it off so smoothly is pretty incredible). I trained all summer, using the FIRST program, to break 3:30 (A goal), or to break 3:36:55 (a PR; the B goal), OR to qualify for Boston ’19 (sub…3:40? Who knows! ; C goal), or to finish without being broken – physically, emotionally, or spiritually (D goal). It’s good to have goals. I missed my A goal by an almost laughable three seconds, running a 3:30:02. The rational part of me is thrilled by an almost 7 minute PR and a nearly 15 minute BQ on a hot day. The rational part of me is amazed to be setting big PRs at 39, and grateful to have emerged uninjured and eager to keep running. But that emotional part of me is plagued by all those things I could have done to get those three seconds back. If only I’d taken a turn tighter, pushed harder, left my iPod alone, skipped the deep dish pizza on Friday night, walked less the day before, eaten one more gel, eaten one less gel, lost a few ounces. You name it. I didn’t collapse at the finish, so I surely had something left! Ok, stop. Stop!! It’s a win. The Chicago Marathon is famous for being flat and fast – a world record course if the weather is kind. But that’s a big if. For us, the weather was…ok. The humidity was on the lower side to us Virginians, after training through the sticky summer months. But after about mile 18, the sun was definitely a challenge. And the crowds! I called this race “the introvert’s nightmare” only partially in jest. If you’re someone who thrives on cheering and cowbells and funny signs, it’s your jam. But if you, say, want to listen to an audiobook, forget it. Too loud. If you want to listen to your own thoughts, even, you may have a hard time. I’m still figuring out the kind of races I like best, but I suspect that this was a little too overstimulating for me. It was a great experience and I’m glad to have done it, especially with good friends. But I also like to run my pace, feel in control of my thoughts and of my body, and be able to access a toilet at the start. Even though I’m still figuring it out, I love any opportunity to talk about running, so I’d agreed to give a guest lecture to the JMU marathon class the Wednesday after the race (this is a class that trains students to run their first marathon in a semester – so cool, and very unusual!). Work your core. Planks, bridges, etc. Mimic race day as much as you can – clothing, fueling, terrain, waking up early. Mimic race day as much as you can. Study the race website and learn all that you can about the event. Plan to be cold at the start (or to discard old clothes at the start). If you’re comfortable before the race, you’ll be too warm during it! Fight the urge to go out too fast. You can’t bank time. You can’t cram for the marathon. It’s not an exam. Training must be spaced out over many weeks or even months. The wall is real. You will have dark moments in those later miles, you’ll want to quit, or maybe to die, and you will learn about yourself as you fight through this. You will redefine what you think is hard and what you’re capable of. You might become a lifelong runner, or you might cross this off your bucket list and never want to do anything like it ever again. Don’t feel like you need to decide right away. Afterwards, walk around, stretch, roll. Fight the urge to be catatonic. You will thank yourself later. [I didn’t tell them this but I thought about it.] The marathon is like the worst boyfriend ever. You put so much thought into your outfit for it. You try to lose weight for it. You bring your A game. It exhausts you. It calls the shots. It’s unpredictable: one minute, it’s making you feel strong and beautiful, the next it’s breaking you down, leaving you powerless and pained. And yet you may keep coming back for more, and very few people understand why. But hopefully your time with it will ultimately make you stronger. The CAT Trail Half, October 28th. Practically in my own backyard, yet very much outside of my comfort zone. I suspect I’d like trail running, if I can keep my competitiveness and Garmin-obsession at bay. The Richmond 8K, November 11th. Also running the last few miles of the marathon with a friend who’s gunning for a BQ. The Rehoboth Beach Half-Marathon, December 2nd. Driving some of the JMU marathon kids up there for their big event, and shooting for my first sub 1:40 half. Some other stuff, probably ill-advised. The biggie, the unicorn, the life goal: my first Boston Marathon, April 16th. What a way to celebrate turning 40. Don’t start crying now — you’ll hyperventilate! This is literally what I had to tell myself a mile from the finish line of the Tobacco Road Marathon. 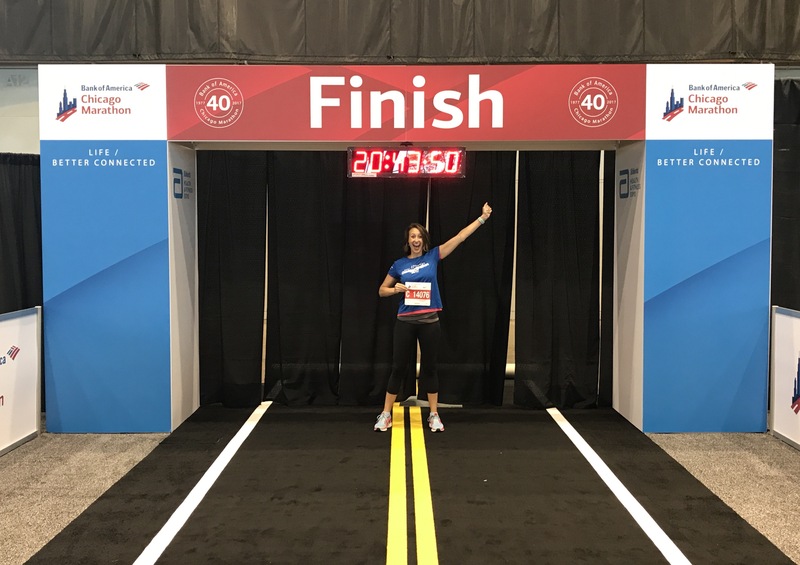 I tried to maintain my composure while also allowing myself to bask in the achievement of a major life goal – qualifying for the Boston Marathon – which I’d pursued with varying degrees of dedication since 2008. Finally! I finished in 3:36:56, a 9+ minute PR and a very comfortable 8+ minute BQ. It’s not an overstatement to call this a peak experience of life. Whether it’s a PR or a PW, every single race has lessons to offer. Here are ten things I learned this past Sunday. When the starting line gets fenced off (about ten minutes before the race), don’t hop the fence to get to your desired starting spot. It’s a great way to tweak something. Find an open spot and walk through it like a normal person. You have plenty of time. If you’re debating whether or not you’re overdressed, you are. A great audiobook will help you happily pass the early miles, when you might just want to be distracted from the enormity of your task. Then, when you switch to your music later in the race, it’ll provide much more of a jump-start. (For me, the formula was: loud music for the first two miles, until the cacophony died down, then Tina Fey’s Bossypants, which never fails to crack me up — and in this context, surely made me look crazy — then my Hamilton/Rush/Dear Evan Hansen/In the Heights/Queen/Lady Gaga/etc. mix from mile 16 to the end). If strawberry-banana flavored anything is unappealing to you, then condensed, thick strawberry-banana Power Gel will be nothing short of revolting when offered to you at mile 22. You will be tempted to take this gel because it is free, and gels can cost two whole dollars, and lookit you sticking it to the man and getting your money’s worth. Don’t do it. Core work is absolutely key for maintaining stability in those last miles. Thanks to CXWORX at ACAC, my hips didn’t hurt nearly as much as usual, I felt less fatigued, and I was able to keep decent form. Smiling and thanking volunteers helps you feel like a human being. And those small moments of connection might just keep you going. Pouring water over your head – even when it’s not that warm out – feels amazing and gives you such a rush! Just make sure there’s enough water to go around, and also make sure that it’s not Gatorade. Consider not running with a pace group leader. They can go out way too fast. (The 3:40 pacer started out at sub-8:10 pace with about 15 people following him. By mile 24, there were two left.) Trust yourself. And know that passing your goal-time pacer in those last miles feels amazing. Especially when he calls out, “Go get it, girl.” And you say, “Hell YES I will!” And then you do. Find people who push you, who inspire you, who make this whole crazy endeavor fun. I wouldn’t have achieved this huge goal without these amazing, fast, hilarious ladies who made getting up at 5:30 am on Saturdays in the winter something I actually looked forward to. This race was fantastic, with our group picking up BQs, PRs, and age group awards right and left. Next up, maybe Copenhagen in late May, which feels crazy right now, but also too cool to pass up. Then Chicago in October. And (how much do I love saying this??) BOSTON in 2018!! 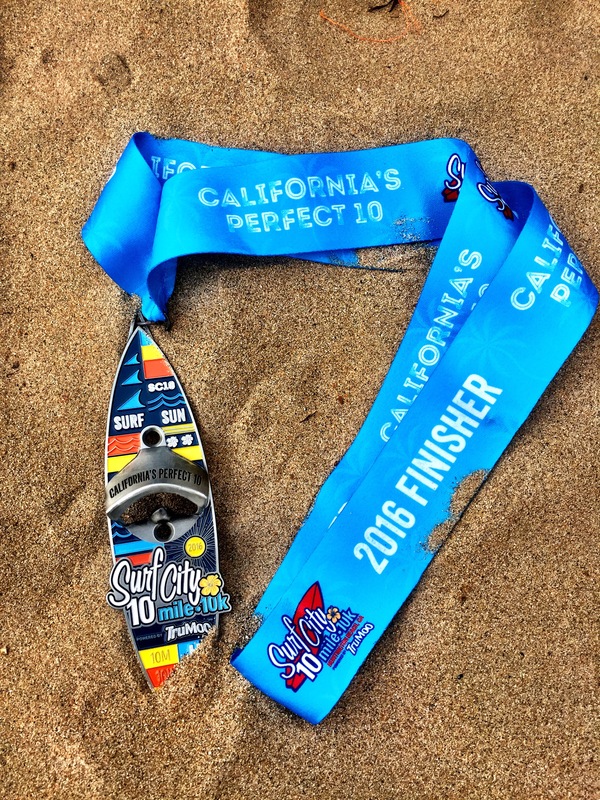 Two weeks ago, I was crippled by a pretty trivial decision: run Huntington Beach, CA’s Surf City 10 Miler, the distance I had signed up for, or heed the warnings of both my physical therapist and my aching Achilles and drop down to the event’s 10K. The two courses were pretty much identical – both out-and-backs along the scenic, flat Pacific Coast Highway. The 10K just turned back a little sooner. As I pondered this decision: to drop down to the 10K or not to drop down, I went into full-on nerd mode as the concept of duration neglect popped into my head. Based on this well-established psychological principle, if I wanted to have good memories of this race, the total distance or time spent running mattered less than did the emotional peak and the way in which it ended! So, what did I want from this race? I certainly wasn’t running it for a prize. I wasn’t in competition with anyone. I just wanted to run strong, have fun, and not get hurt. So, I decided to downplay the distance, or the duration, and opted to ensure a solid peak and a strong end. That way, I would have good memories of this special seaside race. The 10K it was. Looking back two weeks later, I DO have a positive memory of this event. I felt fit and strong the entire time. I ran a negative split and a big PR of 45:06: good for fourth place overall and third in my age group (a shout-out to the dominant 30-39 year-old ladies, eh??). But, beyond these more objective markers of success are my memories of pride and exuberance: Getting faster as time went on. Passing person after person, without pain or fatigue. And then crossing the finish line, shocked that my sixteenth 10K was, unexpectedly, my fastest one ever. Did I wish for a second that I had run 10 miles? No way! Distance had become way less meaningful than I’d expected. Duration neglect was alive and well on the PCH. I had a solid peak and a strong end. The miles I’d logged were unimportant. But sometimes duration neglect can work against us. Another decision I’m grappling with is whether or not to run the Richmond Marathon in a mere two weeks, given my Achilles pain and other mysterious and enduring foot aches. Here, duration neglect takes center stage again. When I look back on previous marathons, even recent ones, details of the multi-hour slog are all but gone from memory. What remains is that peak – the realization that I am going to do it. That singular sense of badassery and pride as the miles tick by. And then the end – the triumph of crossing the finish line, getting my medal, and maybe eating a massive burger. So, to run the marathon or not to run the marathon? As it unfolds over three-plus hours, it will be so much more than a peak and an end. It will be 26.2 miles, a distance that is just plain hard to get my mind around in any kind of real way. Mile 1-3 – navigate the crowd, try to resist the urge to go out too fast. Miles 4-8 – a nice straightaway, settle in to a comfortable pace. Enjoy some downhill. Have a gel around 8. Don’t speed up too much. Miles 9-12 – Cross the James, go through some woods, hit a gradual uphill. Don’t even think about being done yet. Mile 13.1 – Halfway…only halfway. Be happy-sad about that. Miles 14-16 – Approach the windy, gradually uphill bridge I’ve heard about. Try not to get psyched out. Fight through. This might be the worst of it. Maybe switch from podcasts to Hamilton. Have another gel. Mile 17 – Back to downtown, optional bail-out point. Don’t do it! (Unless your Achilles is sending you an unmistakable QUIT message. Then do it.) See Mark. Don’t do the math. Don’t kill people with cowbells. Miles 18-20 – Enter potential slog territory. Try to catch up to people ahead of you. Smile when hitting the 20 mile mark. Stop worrying that your toenail fell off. It probably didn’t, and who cares if it does? Miles 20-23. Enter that boring section of flat and ugly. Just think about anything else. Crank Hamilton. You are not throwing away your shot. Miles 24-25. You should know at this point if your BQ is likely. And if it is, you will feel so freakin’ amazing. Remember last year’s half, when you hit this section and felt so happy knowing you were going to finally break 1:45? Like that, but better. This is your peak. Bask in it. Enjoy the massive downhill and cross the finish line! So, does this pull focus from the peaks and ends from marathons past and give me a sense of the distance and challenge I’m up against? Yes. So why do I feel pumped up instead of intimidated?? Maybe that’s my answer. Bring it, Richmond! The Pepsi 10K, one year later. Late last summer, my angry low lumbar spine was soaking up the sweet, sweet goodness of a series of epidural steroid shots. I was told that the benefits, if any, would be gradual, but I woke up the day after my first shot feeling fresh and new and pain-free for the first time in years. Gone was my morning hobble and its accompanying grumpiness. Gone was the pain that shot down my right leg after driving for more than 10 minutes, which left a series of doctors, chiropractors, and physical therapists baffled. This was great, but how would running be? Tentatively, I went out to try the Pepsi 10K, a local favorite that benefits Special Olympics. It was one year ago this week. Mile 1 was downhill and adrenaline-charged. Hard to gauge what was happening. But by mile 2 and 3, I was sure: the pain was gone! I welled up. Running had suddenly been transformed from a painful slog (yet a habit I stubbornly refused to give up) into a source of joy again. I was ecstatic. It was like Christmas. I did not run my best race that day. But my love of running was back. My optimism was back. And I was so grateful. And my next few weeks of running remained full of gratitude. I kept expecting the pain to return, as these spinal shots don’t work their mysterious magic forever, so I thought of each run as a gift. My back was like Charlie’s brain in Flowers for Algernon: Enjoy it while you can! But…the pain never did return. So I kept running. And added in some other good stuff like planks and squats and a foam roller. And I kept getting faster. 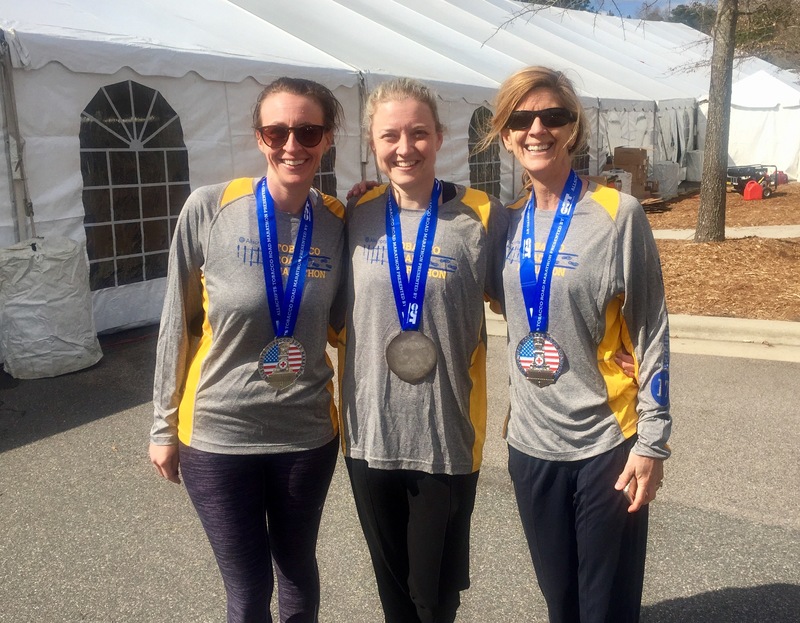 I broke 1:45 in a half marathon in Richmond in November. I ran a 5K PR (22:28) the next month. I broke 80 minutes in the Ten Miler in March and 1:42 at the Park to Park half in April. Sub-8 minute miles no longer felt like an all-out sprint but like something I could sustain for over an hour. 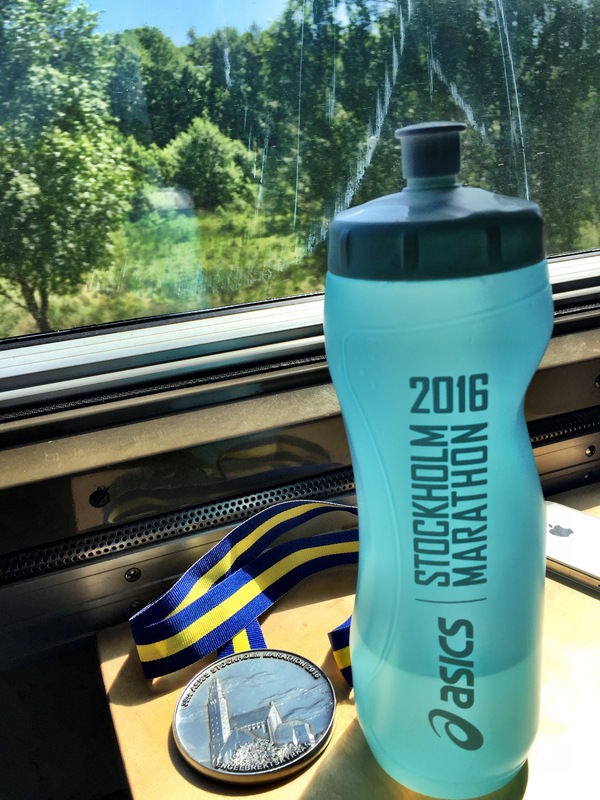 Then, simply because it lined up with my travel schedule, I dared to sign up for the Stockholm Marathon in June. I ran a 3 minute PR there in June (3:45), no wall-hitting, no death wishes. Just some backlogged podcasts and then the Hamilton soundtrack, plus sun, sea, smiles, and Swedes. What was happening?! I was proud and feeling quite the badass. But somewhere in all of these successes, my gratitude for the simple act of running started playing second fiddle to my competitive nature, while basking in my pain-free glory was supplanted by concern for new, minor aches and pains (Achilles, feet, blah blah, boring). Anyway, today, I ran the Pepsi 10K again, and was suddenly reminded of the wonder and appreciation I felt a year ago, as well as all of the progress I’ve made since. (And, ok, I ran a PR, too: 46:56.) I didn’t feel that teary, awed gratitude nearly as deeply this time – maybe that would be impossible – but the rolling hills of Owensville Road were a strong reminder. It’s so easy to forget what a gift running is, you guys. And what a gift the steroid shot can be, too. 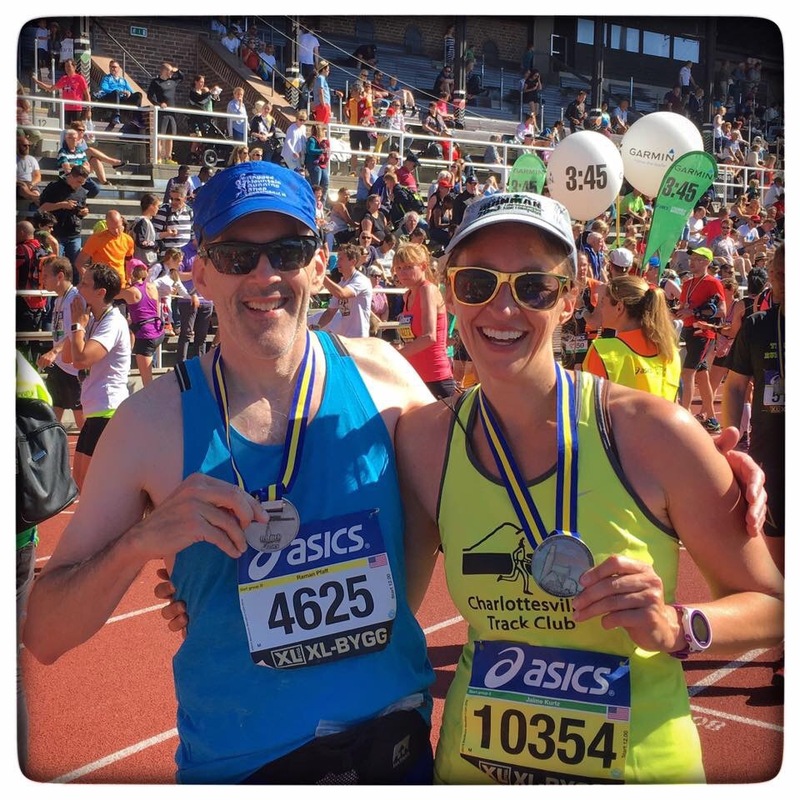 On Saturday, June 4th, I ran my first international marathon (my sixth overall) on what turned out to be a glorious, humidity-free, 60-something degree day in Stockholm. In the weeks prior, I had an increasing awareness* of a nagging left achilles and various, undiagnosed sensations in my feet. Plus, I was probably undertrained, having done only one twenty-miler. And I had some vague memories of really, really hating the late stages of marathons, which explains why I hadn’t done one in six years. This could be ugly. The race started at noon, which I expected to be completely jarring. 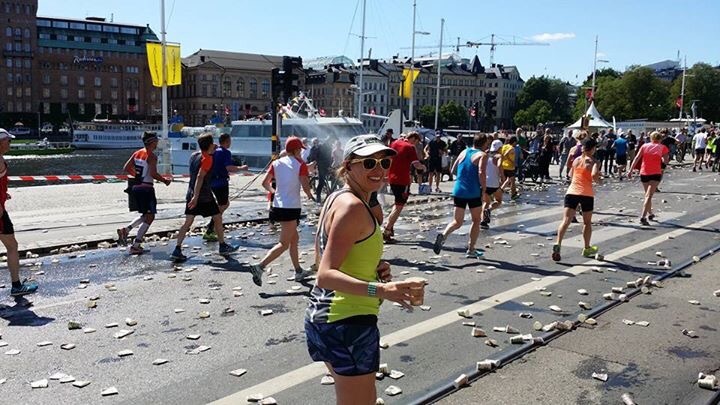 However, lingering jet-lag, a penchant for getting lost wandering Stockholm, the logistics of staging a 18,000 person event, and moderate temperatures made the late start-time pretty ideal. I started in the correct pace group (about 8:30 min/mile), which was good since there was no getting past the pack of Scandinavians I was trapped in. Backlogged podcasts** got me to mile 16 and then I shifted to my inspirational running playlist*** which got me home. Around mile 24, I was more than ready to be done, sure, but somehow I never hit the wall. The home stretch: I entered the Olympic Stadium, sure that the finish line was mere steps away, as I was already past 26.2 . But we still had to circle the track, which created some sense of ceremony but also made for a race of 26.7 miles! What?! Despite that injustice of this, I ran a three-plus minute PR of 3:45. And, I guess I also inadvertently ran the longest distance of my life. I was saying how, although I had no real desire to run a marathon again until a Boston-qualifying time was a real possibility (i.e., this fall! Bring on age 40! ), I wanted to do this one as a way of seeing this beautiful city where I’ve started to teach and visit every summer. Funny, then, how little I was focused on the scenery around me. It was more like, “find the water!” “don’t step on that person!” “focus on your music!” Marathon-survival mode rather than savoring mode. The cardinal rules of marathoning – don’t eat anything new or weird! Rest up a few days before! – are in direct opposition to the rules of travel and exploration – eat all the weird things! Walk around and see everything! I walked 6 miles the day before and was worried I’d blown it. I hadn’t. But the temptation was there in a way it isn’t at home. I don’t know if it was this race in particular or non-U.S. races, but it felt much more serious. Very few runners in costumes, no spirited bunches running for a cause, zero funny signs about pooping, loud cheering, and – mercifully – only one deafening cowbell. The men all peed in a communal porta-potty thingie beforehand, which cut back on lines dramatically. Could American men do such a thing outside of Foxfield? Do American porta-potty companies even make such a thing? Having the race marked in kilometers instead of miles was a mental challenge. Like, “Oooh, I’m at mile 21 already! Oh wait, that’s 21K…13 miles. Crap!” I had to stop looking at the markers. On the upside, I took some perverse joy in confusing the metric-minded around me when my Garmin chirped at each mile. Course fuel: pickles, vegetable broth, coffee, cola. Glad I brought my own Gu. Stockholm’s “hills” have nothing – NOTHING – on Charlottesville’s. The finishers’ shirt was hot pink. European men don’t mind hot pink. The post-race hot dog: the first I’ve had in years, and nothing could have tasted better. If you don’t have cell service and hope to meet up with someone after the race, in a crowd of many thousands, when you’re likely to be utterly exhausted, have a fail-safe plan. Despite a plan of-sorts, Joe and I only found each other through sheer luck. Best cheerer and photographer ever. Look who I finally saw at the finish line. If I can just slightly improve on this time for the fall, the BQ should be mine, fulfilling a goal I’ve had for almost ten years. This race was great mental preparation, as it was the first marathon I enjoyed from start to finish. No wall-hitting, a perfectly even split, and full mobility for sightseeing the next day. Oh, and I even was awake and chipper for a nighttime dinner cruise afterwards, where one of the editors of German Runner’s World said, upon hearing my time, “Oh, you’re a real runner.” That’s right. A. Real. Runner. * awareness is not the same as pain or injury, and is at least 50% psychosomatic. ** deepest gratitude to Slate’s Double X, Getting In, The Moth, and Embedded. *** mostly selections from the Hamilton soundtrack, but with some Styx, Sara Bareilles, and Shakira peppered in.